There’s a pasta cooking technique that involves breaking thin noodles (usually spaghetti or linguine) in small pieces, frying them until golden in copious amounts of oil, then boiling them as usual. The result is tender pasta with lots of flavor — and lots of fat and calories. If you’ve read this blog before, you know that while I don’t stick to a rigorous diet, I do have an aversion to deep frying. My goal here was to get that deep umami flavor from toasting while minimizing the fat. The answer: combine the browned pasta with rice pilaf. A pilaf starts with a mirepoix: diced aromatic vegetables. Start with onions (or shallots) and garlic, then add celery, carrots, or even a little minced bell pepper. Once they’re softened, the rice is given a quick sauté before the liquid (often broth or stock along with water) is added. All those steps add flavor. Soba noodles have a deep nuttiness that’s enhanced by sautéing. I do recommend using a white rice such as basmati, jasmine or even your basic grocery store plain white grains. 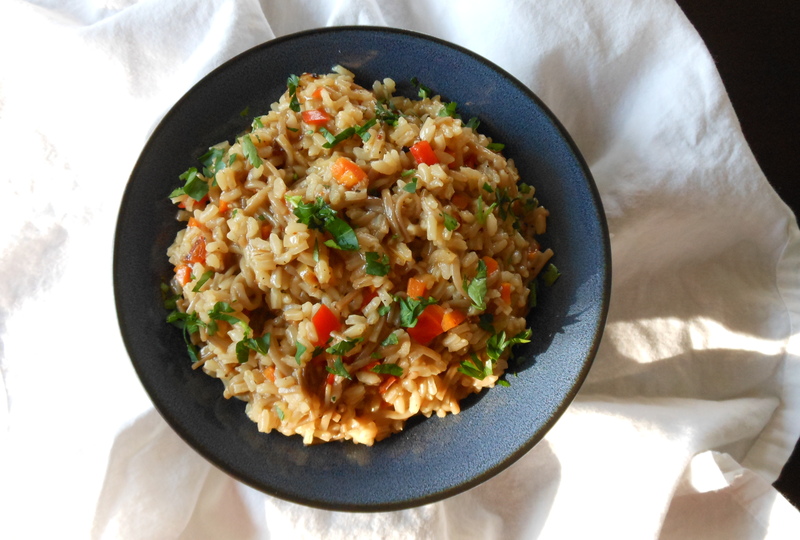 Arborio rice makes a creamier, almost sticky pilaf; the other rices result in a lighter, fluffier dish. Brown rice takes much longer to cook than the noodles do; the soba’s reduced to mush by the time the brown rice is tender. This is my favorite type of dish — more of a technique than a meticulous recipe. Play around with the proportion of pasta to rice, use vegetable stock or even mushroom broth instead of chicken stock. Add white wine, or leave it out. Lessen the liquid by 1/4 cup or so for a drier, fluffier pilaf; increase it for a creamy, moist dish. Use broken pieces of spaghetti or linguine instead of the soba. Play around with the herbs and spices. Add paprika, saffron, or curry powder (not necessarily at the same time) if that’s your thing. It’s minimal work for great flavor. Spend a few minutes chopping and sautéing, add the liquid, slap on the lid and walk away for 20 minutes. Serve it with grilled fish, roast chicken, steaks, or just a lovely pile of vegetables. Melt the butter with the oil in a medium saucepan with a lid. Add the onion, garlic, and carrot and cook for a few minutes to soften the vegetables. Break the soba noodles into roughly 1/2-inch pieces over the pot. Stir well, and toast the noodles, stirring occasionally, until they and the veggies are lightly browned, about 8 minutes. The soba can go from toasty to burned quickly, so don’t walk away. Stir in the rice and toast for a few minutes longer. Season well with salt and pepper. Add the wine, then then the stock and water. Bring to a boil, then cover, reduce the heat to low and simmer for about 20 minutes. Give the pilaf a stir and a taste. Add more liquid if the rice needs more cooking time, and more salt and pepper if it needs seasoning. When the rice is tender, stir in the lemon juice, fresh herbs, and parmesan if using. Serve immediately. This entry was posted in pasta, rice, and grains, sides and tagged casserole, noodles, pasta, pilaf, rice, side dish, soba noodles. Bookmark the permalink. Another great recipe idea! Thanks Nancy.